GV Miao (fashion blogger) got her feeling of attachment to the Taiwanese designer Wang-Chen Tsai-Hsia for Shiatzy Chen probably because she herself is half Taiwanese (her mother is Taiwanese) and born in the States. Wang-Chen started her fashion career in the 1970s as a seamstress in a clothing store in Taiwan and has become the founder/design director of Shiatzy Chen and the only Chinese member of the French Fashion Federation thirty years later. Her designs have always been beautiful and full of oriental elegance since the debut of Shiatzy Chen at the Paris Fashion Week in 2008. Wang-Chen blends Eastern and Western fashion senses into her clothes. They are crafted in Western cuts, in top-quality brocade and silk with exquisite hand-stitched craftsmanship like embroidery, appliques and beading. The brand spirit for Shiatzy Chen is “neo-Chinese chic,” which transfers traditional Chinese aesthetics into modern fashion design, and therefore its collections always result in a beautiful amalgamation of oriental aesthetics and western splendor. Each season Shiatzy Chen picks a Chinese element as an inspiration for the new collection, such as the essence of jade for the 2010 Fall/Winter collection, traditional Chinese calligraphy and classical ink and wash paintings for the 2010 Spring/ Summer collection, the Silk Road for the Fall/Winter 2009 Collection, and Chinese porcelain works for the 2009 Spring/ Summer collection. The inspiration for Wang-Chen this season was traditional Chinese puppetry. As GV Miao commented that in typical Wang-Chen Tsai-Hsia for Shiatzy Chen style, the clothes embody the spirit of “neoChinese chic.” Without exception her latest collection at Paris Fashion Week Spring/Summer 2011 beautifully harmonized eastern aesthetics with western ones, demonstrating how cross-cultural fashion fertilization can make for some great clothes. In the designer’s own words: “This collection employs traditional Chinese art of shadow puppetry with western art deco essentials... Just like traditional Chinese puppetry, the collection instills elements of light and shadow through theatrical emotions and opulent imagination.” The rigid and geometric lines, combined with a softness of silhouette layered on top and flowyness of many light-weight fabrics, such as silk chiffon, organza and lace formed an interesting contrast. The color combination of gold, goldish yellow and tangerine added a sense of extreme luxury to the designs in Chinese culture. the patterned organza evening gowns with flowy trains are GV Miaoâ&#x20AC;&#x2122;s favorite in this collection. red is traditionally an auspicious color in Chinese culture and represents happiness and good luck. The shadows of the models disappeared one by one behind the red screen â&#x20AC;&#x201C; an action which echoed the shadow puppet theme. Today the fashion industry has become more aware of anorexic models and the dangers of anorexia nervosa compared to when I was working as a model twelve years ago. However, there are still lots of girls who suffer from the inhuman demands set forth by the modelling agencies and the industry as a whole as to how the body of a young model should look. A study from 2007 indicates that approximately 40% of all models might currently be suffering from some kind of eating disorder. Like others who suffer from anorexia, an anorexic model develops fear of becoming fat and – as a consequence of this – of losing jobs. Unfortunately this fear is not unfounded. Many models have been told by managers that they need to lose weight in order to keep working. I remember very clearly how I was constantly told that I needed to lose weight, even though I was a size 36 and 180 cms tall (57 kgs.) I was still being turned down for modelling jobs because I was considered to be too fat. I tried extremely hard to lose weight; I went to the gym daily for 1½ hours, and I was neurotically aware of what I ate. Making matters worse I was still told that my hips and thighs were too big. The pressure on a young teenager like myself was and is extremely hard, and many girls (and boys) can’t handle it and develop some kind of eating disorder. I specifically remember a girl suffering from bulimia, who told me that she would just throw up her food every time she had eaten, and she was already extremely skinny with a BMI well below what is considered healthy. Another girl told me that she took some very strong diet pills in order to keep her weight down. The pills were most likely some kind of ephedrine, which is considered an illicit drug among athletes today. She was a gorgeous girl who had just started modelling, and she had the perfect body for the job; a small and petite figure, small breasts and a nice and small bottom. I didn’t see her for about six months, and the next time I met her she was a totally different girl with no breasts and no bottom. The most shocking thing I remember about her was the fact that she had developed a fine, thin layer of hair all over her body. Growing a layer of hair like this is a very clear sign that a person has an unhealthy body weight. When a body is completely emaciated its temperature drops and an extra layer of hair develops as a sort of self-defence mechanism to keep it warm. This girl was clearly suffering from anorexia nervosa, and the fine layer of hair on her body should have been recognized as a clear danger sign by the managers in the fashion industry. I think many models start out on a small scale by just paying attention to their weight and by dieting and exercising. Then slowly over time their self-image gets distorted. They start perceiving themselves as fat and they become really obsessed with food and develop a fear of gaining weight. At a certain time in my life I myself ate diet pills. They were available only by prescription, but I had gotten them from a friend who was overweight (she was not a model and the pills had been prescribed by a doctor). In addition to this I used a lot of laxatives and often threw up my food. I even exercised daily for a couple of hours. Ultimately it paid off: I got pretty and skinny, but I also remember how horrible and lonely that made me feel. Upon quitting the fashion industry it took me years to learn how to cope with my body and have a normal relationship with food again, not to mention learning to live with the physical consequences on my body due to the many years of malnutrition and extensive use of laxatives. I was lucky in the sense that I was able to overcome my eating disorder at a young age with only minimal damage to my body. My personal advice to young models out there â&#x20AC;&#x201C; both girls and boys â&#x20AC;&#x201C; is to watch out and listen to your body. If your BMI and body fat percentage start becoming dangerously low, it can have severe consequences for your body and it can affect you for the rest of your life. 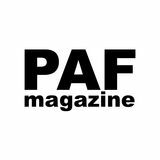 PAFmagazine is an online magazine about Photos And Fashion.